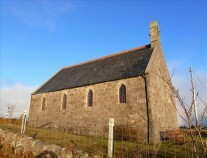 This church lies about 1.6 km outside Fionnphort on the Ross of Mull, above Loch Poit-na-h-I, and beside the A849, which connects with Bunessan and Craignure. 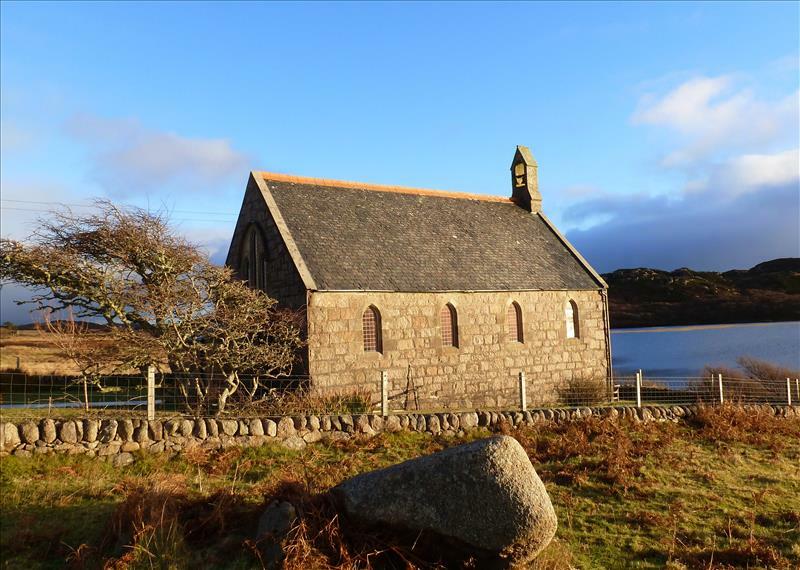 During the 1890s it was decided, by the Church on Iona, that a Mission Chapel should be built at Creich in the Ross of Mull and dedicated to St Erana. Ernan, formerly Prince of Donegal, was uncle to St Columba and one of a group of twelve followers who came with Columba to Iona to set up and manage the Iona Monastery. Through the efforts of the then Parish Minister, the Rev. Archibald MacMillan (his gravestone is in the church yard), money was raised to build the church. Plans of the church were approved by Presbytery in 1897 and a site chosen to benefit the community. The land belonged to the Duke of Argyll and he stipulated that the Trustees – three local men – were to be responsible for maintaining the church, which was to be used only ‘for worship, for the Sunday School or Mission, or other religious works in connection with the Church of Scotland’. It was to be kept ‘in good repair’ and well maintained, its gutters clear, and its roof sound’. This is described in the church records as ‘quoad sacra’. The grounds were to be enclosed ‘with such suitable and sufficient walls or fences’ and to be drained. No part of it was to be passed on to others. A feu duty of one shilling (5 pence today) was payable every year on Whit Sunday. If the Trustees ignored any of these stipulations, the church with all its contents and the grounds, would instantly become the Duke’s property again and there would be no appeal. The Feu Charter (Title Deeds) were duly signed and sealed with a red 6d (about 2p) stamp showing a crown surrounded by laurel leaves, and ‘presented for Registration at Edinburgh on the Twentieth day of October in the year One Thousand Eight Hundred and Ninety-nine’. Every page was endorsed at the bottom with one bold word written in black ink – ‘Argyll’. 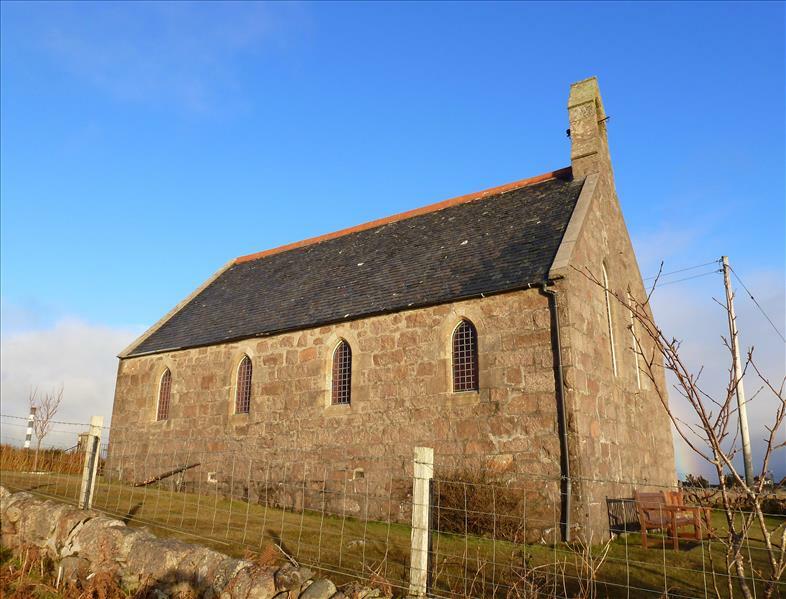 The church, simple and solid, is built with coursed, red granite from a nearby quarry and has direct fixed leaded windows with a slate roof supported on exposed trusses. On the south side is a bell-cote which is still in use. At the north end is a small vestibule, its double doors facing east, and on the east wall is a vestry with south facing doors overlooking the Loch. Both extensions have lean-to roofs. There are four, mid-sized, gothic windows on each side of the nave and a triple-light, gothic window at the chancel gable. The total cost of the build and furnishings was £621, much of the labour having been voluntary. Inside the church there are the original dark stained wooden pews, which seat up to ninety people – one pew has been removed from the front to provide more room. The roof trusses and rafters are ‘collar-beamed with braces’ and the high ceiling is made of wood. The pulpit, communion table and font are all at the south end of the church. 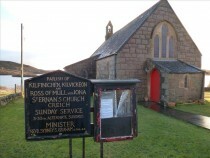 These were given to the church in 1952 by the War Memorial Committee and Mr Dawson-Bowman of Erraid. In 1970 fifteen of the leaded windows were renewed and the plasterwork removed from the south-facing wall exposing the granite. A new electric organ replaced the original one in 1977 and in 1990 a new wooden floor was laid. In the vestibule is a War Memorial stone listing the names of the men from the Ross who gave their lives in the two World Wars – 15 men in World War I and one in World War II. The War Memorial is about 30 m to the east where the road to Kintra leaves the main road. When the church was first built, heating was provided by an open fire – the fireplace is now boarded over. From 1939 unti 1956 calor gas was used for lighting and was then replaced by electricity. Benefactors have provided the church with many items including the carved wooden collection plate from Iona, and a brass Celtic cross mounted on a base of Iona marble. For more information see: The Story of St. Eran’s Church Creich, Isle of Mull Centenary 1899 – 1999, from which the above notes were taken. Many thanks. 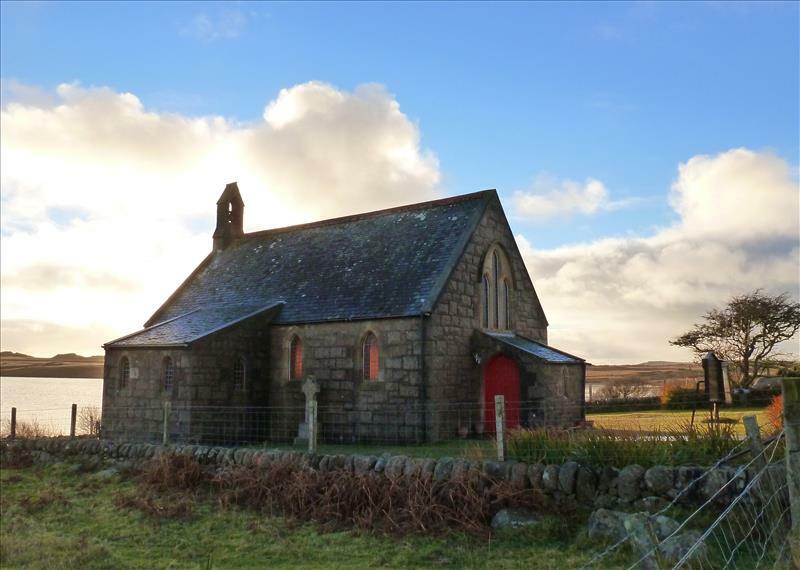 The church is open only during service times, which are alternate Sundays with Bunessan Parish Church, at 2.30 pm.